I named it 'The Guardian' - preserver of memories of a time before chain saws. I love big old trees. Of the living things on this planet, trees are the grand monarchs. They tower higher, spread wider, and have endured longer than any other. When danger comes, they do not run and hide - they lift their grim, strong faces and endure. Storm and fire and wind and drought strike like bandits and then flee, but the trees remain, bearing the scars wrought upon them as testaments to lives lived with pride and honor. So great is the influence of the trees that our planet would not be the same without them. They create their own climate. They stop the wind, squelch the frost, lift vapors out of the deep loam and orchestrate the rain. They form and husband the soil. They purify the river and tame its flood. Lesser living things come to the trees, seeking shelter and sustenance and protection--all except man. Man comes with his fire-blinded eyes and his ripping tools; and he destroys. But I do not lament for the trees. They are stronger than man. Man is just another bandit, coming, battering, and fleeing into the dark. The trees will still be there after man has gone. So today I had the honor of visiting one of the real monarchs of the tree-realm near Holton Spring, Florida. This tree just gained the designation as Florida's champion on January 16, 2012, when a drug addict burned down the former champion, known as 'The Senator'. This new champion doesn't have a name yet. I vote for 'The Guardian'. The Guardian is less than a mile from the Florida Trail where it passes through the Holton Creek River Camp. The trail follows the Suwannee River through much of this area, which is underlain by limestone. The bedrock here is riddled with caverns and sink-holes. It is in one of these sinks that The Guardian lives. Out of another flows Holton Spring, a first magnitude spring (discharging more than 700 gallons of water each second). They call it Holton Creek, but to my sensibilities this is a river--springing out of the earth fully formed. Wow. Along the banks of the Suwannee today I was able to walk some nice sandy beaches. I passed Mill Creek Falls - one of the nicer waterfalls I've seen in the state. Even here the water (look on the left) actually flows through a hole in the limestone. 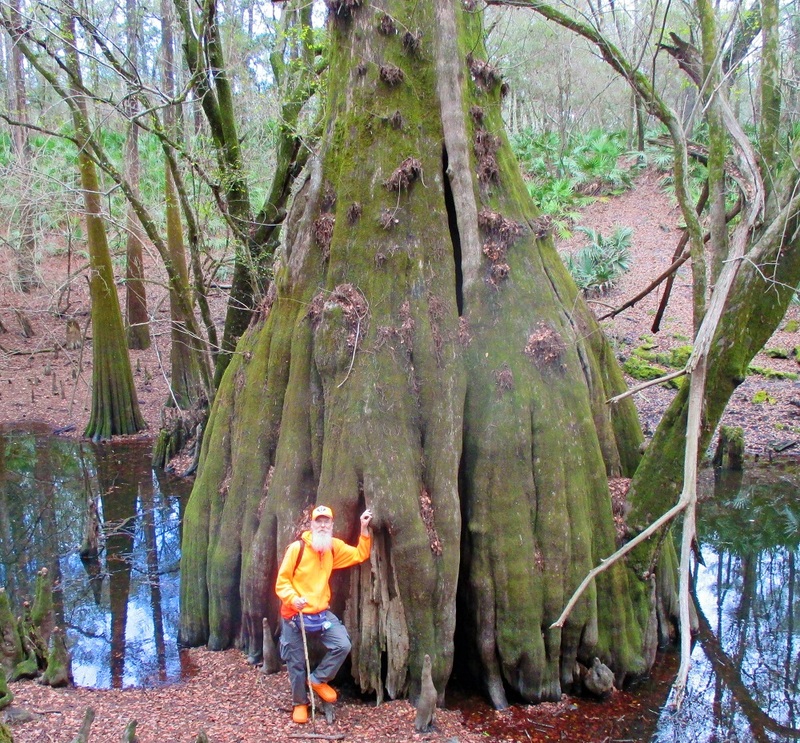 There were more cypress trees. Here are some whimsical arches that one had constructed. I was again reminded by this red maple tree that autumn is lingering in mid-January here in north Florida. 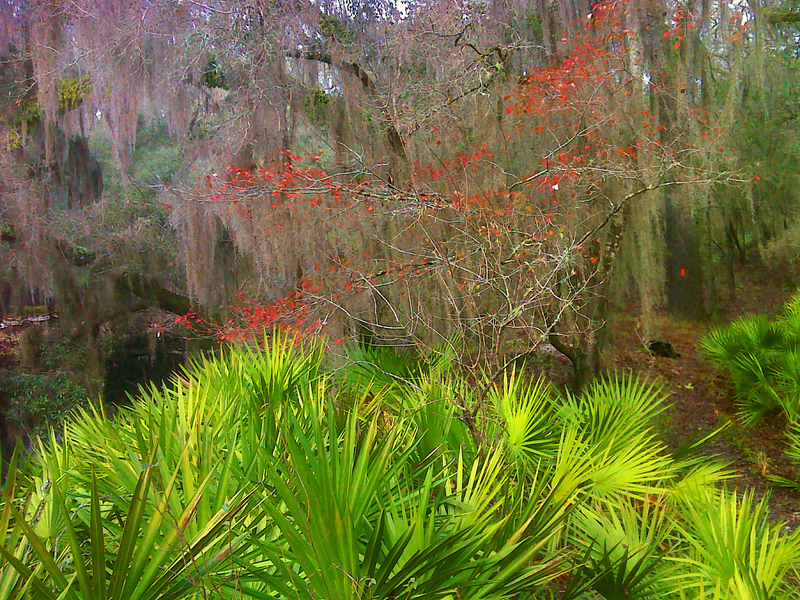 This photo has a nice color contrast of red maple with gray Spanish Moss, green palmetto, glimpses of white limestone and black river at left and an orange Florida Trail blaze at right. And here is an old tree that has passed on, but still carries on telling its tale of hardship and endurance. As I did beside The Guardian, I lingered here by this old stump, studying it, marveling, wondering what forces gave it such distinctive grain. Yes, it was another day of hiking with trees. I came before The Guardian as a lesser being seeking its strength, and I left it with the understanding that I tried to express up top. Man is but a gnat by comparison with such great living things. The Guardian was born during the early days of mankind's profligacy, and it will probably live to see its end. The trees know how to take care of themselves. Below is a map of today's hike, with links to many more photos. The size of that cypress is mind boggling. Any idea how old it is? What a great blog.. and love seeing all the pics and your wonderful descriptions of your daily adventures.. I am strickly a day hiker but sure do admire you folks that do the long distance back packing..keep it up.. I started hiking in 2009 when I retired and try to do at least 2 hikes a week varying from 1.5 to 2 hours.. thats about all my gimpy knee will take so I live vicariously through your hikes and all those other long distance Florida hikers..